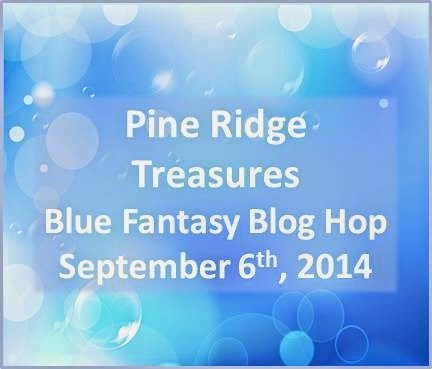 I have to admit that I love the blog hops hosted by Lisa Lodge of Pine Ridge Treasures. To begin, you purchase a kit from her and she always sends so many goodies in the kit. I try to remember to take a picture before I begin but I totally spaced it this time. My kit this time consisted of all kinds of gorgeous blue crystals and brass findings. Now mind you, I loved the brass findings but I didn't end up using them because they just didn't seem to go with the crystals this time around but you will be seeing them pop up elsewhere because I love brass. In this first necklace, I wanted to highlight these gorgeous chinese crystal briolettes from ZNetShows. In fact I am pretty sure that all of the crystal is from this vendor and I can say from experience that they have some wonderful crystals in gorgeous colors. 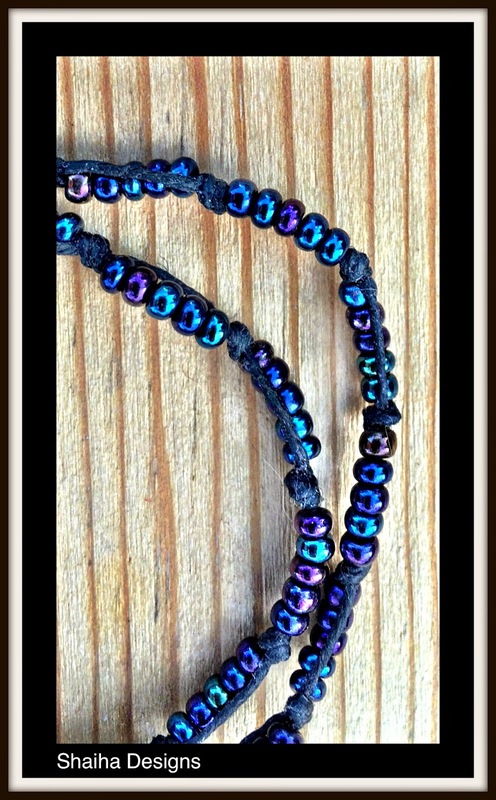 I added some onyx beads to play off the beautiful blues and finished it all off with a pewter clasp. This next one, I wanted to play with waxed linen and seed beads. Love how this pattern worked out. Those blue iris seed beads have some great color. But I am sure you would like to see the whole necklace. The focal is a pressed glass and one that I have had forever. I am so glad that I finally found a home for it. The huge crystal roundelles were part of the kit that I got from Lisa. And last but certainly not least, this pair of earrings was made using some of the smaller blue crystals from my kit. The gold finding and earwires were ones I picked up elsewhere. These earrings will be donated to Ears To You. Now this is a hop so be sure to check out what everyone else has made. I know that I can hardly wait as one person let it drop that she has made at least eight different designs. Your designs get more wonderful all the time! In that first one, I'm very fond of the blue and black together, but seldom see it done! It's just eye-poppingly gorgeous in your necklace! And I love what you did with the Irish waxed linen thread with the metallic beads in your 2nd piece! Glad you shared that close-up photo with us! Great work, Shai! I love your second necklace. It is nice to know about Ears to You. Well done ! I love all your pieces, but my absolute favorite is the second necklace, the colors and the design are just amazing. I love it. 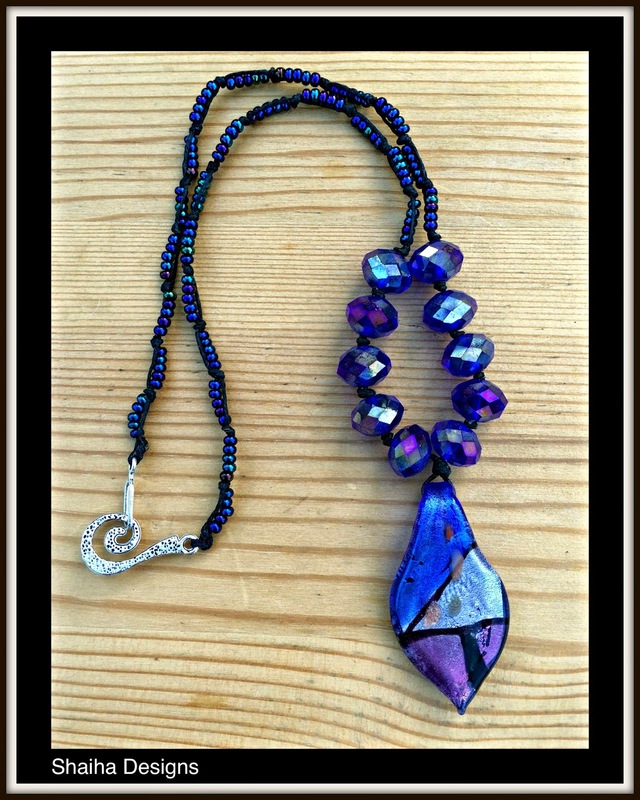 Hi Shai, The black you used in the first necklace really made the blue briolettes pop. The focal in your second necklace is lovely. You picked the perfect elements for that design. They play off each other very well. I like the earrings too. The onyx is gorgeous with the blues. Love that necklace! 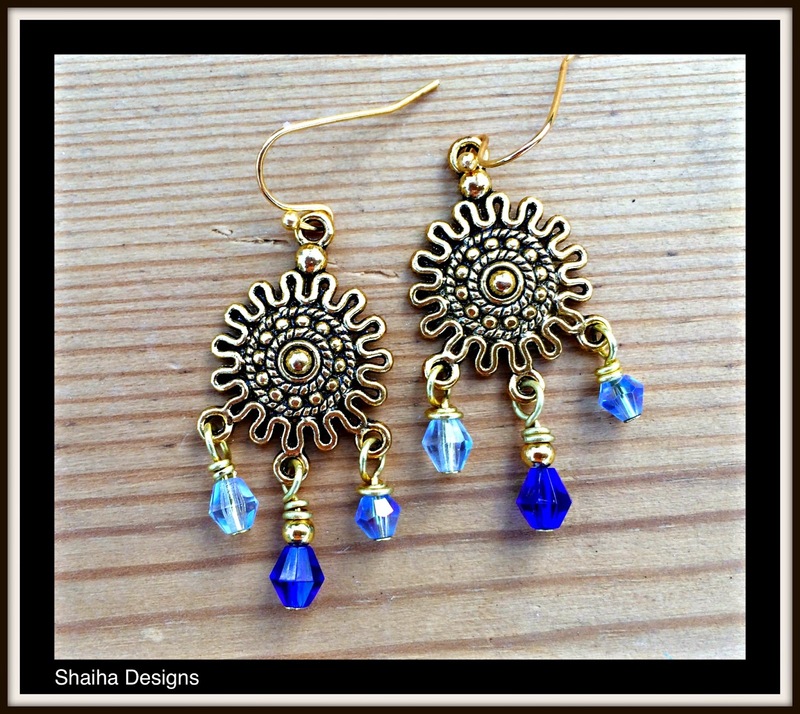 Shaiha - Your jewelry made me say Yay! Every piece is a creative feast of blue goodness. The second necklace is my favorite. That focal fits the design perfectly. Thanks for being in the hop! Your blue combos are gorgeous! Such a vibrant pop of color! I am particularly fancying those earrings..those would be on my ears for quite some time..I love that style! Beautiful. Your two chunky style necklaces are like a shirtless hunk at Walmart...impossible not to notice! As I scrolled down your blog to see the reveal it was like 'hello" aren't you one gorgeous black and blue number! Scroll a bit farther and chaa, chaa, chaa...you got style with all your swirls and curves...let's go dancing! 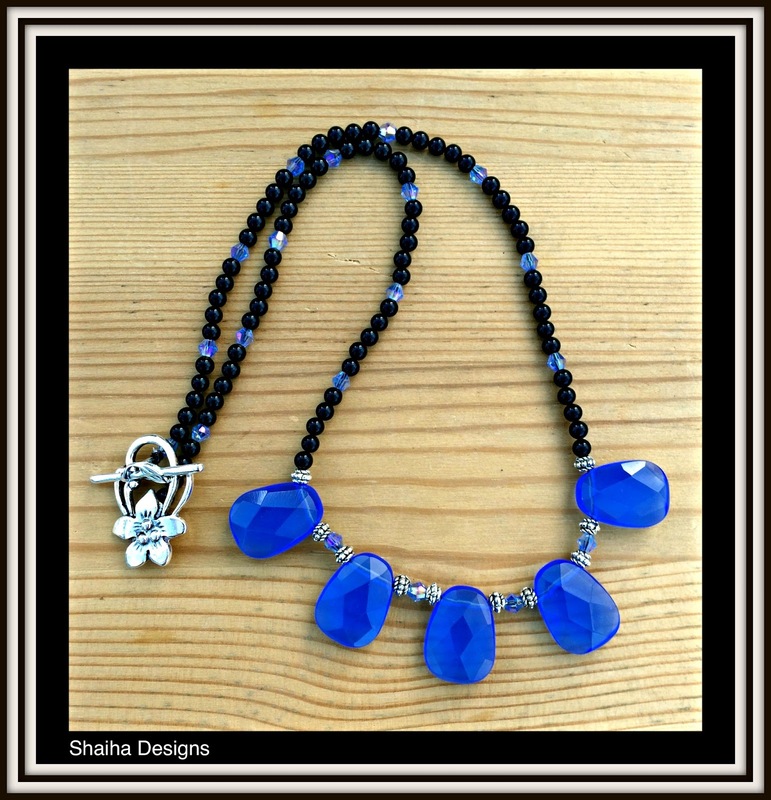 Love the combination of the black with the blue in the first necklace. Fantastic! Pretty pieces! 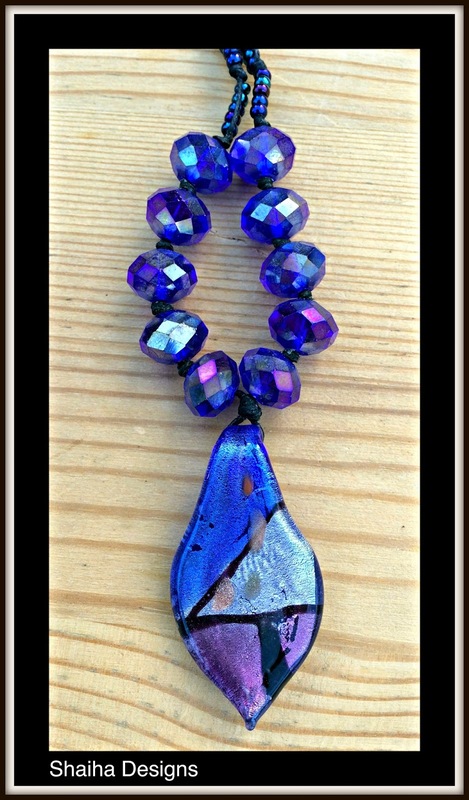 I especially like the necklace with the pressed glass pendant. Glad it found such a nice home. Cool clasp too. Great Pieces...I always enjoy seeing your designs. Gorgeous blue combos!! I really like the way the first one just pops w/the black intermixed. Cool design on the second one with the waxed linen. And those earrings are super! The gold finding looks like an ancient sun symbol or something along those lines and the blue crystal really stand out - very pretty indeed! Lovely pieces, I can't pick a favorite. Those crystals are so yummy, and the pressed glass focal is gorgeous. Beautiful pieces! I love the second necklace, though if I had to really choose it would be hard to do. Excellent work!